New plans to add other water sources will allow us to put our water from Hetch Hetchy to its highest and best uses. Image of O' Shaughnessy Dam courtesy Flickr user basegreen. In the High Sierra it begins with a trickle of snowmelt. The snow and rain falling in a large granitic valley with little human activity and no development provide as pristine a water source as can be found anywhere in California, and perhaps the world. The Tuolumne River gathers steam through the Grand Canyon of the Tuolumne, cascades over Waterwheel Falls and pools in the Hetch Hetchy Reservoir, the portal where San Francisco sticks a giant straw into this watery paradise. From O'Shaughnessy Dam at the lip of the reservoir, a system of pipes, tunnels and reservoirs, stretching 167 miles across California, delivers 218 million gallons of Tuolumne River water to the Bay Area each day. The water is so good, it is one of only a handful of surface water supplies in the United States that the Environmental Protection Agency has determined does not need to be filtered—eliminating a process that is expensive, reliant on chemicals and energy intensive. The regional water system also picks up about 15 percent of its supply from smaller watersheds (which are filtered) on the Peninsula and in Alameda County before it arrives in our taps. Altogether, the San Francisco Public Utilities Commission delivers an average of 265 million gallons a day to its customers. The Hetch Hetchy water system is not only a marvel of engineering for its sheer scope, but also because water flows from mountain to tap almost entirely by gravity. It is unquestionably one of the most important pieces of infrastructure underlying the growth and development of the Bay Area. Its continued reliability is essential to 2.5 million people in the region, and to our health, safety, economy and prosperity in the future. But parts of the regional water system—built between 1914 and 1933—are reaching the end of their design life. In addition, the system straddles the San Andreas, Hayward, and Calaveras faults, so it's vulnerable to a major earthquake event on any one of them. In 2004, the San Francisco Public Utilities Commission began construction of a comprehensive seismic retrofit of the system—known as the Water System Improvement Program or WSIP—to ensure the reliability of the system for at least the next 30 years. The WSIP includes more than 80 construction projects, such as a dam replacement, new tunnels, a new pipeline under San Francisco Bay and new state-of-the-art water treatment facilities. One of its key goals is to make the system so resilient that water service can be restored to 70 percent of customers within 24 hours of a major earthquake. 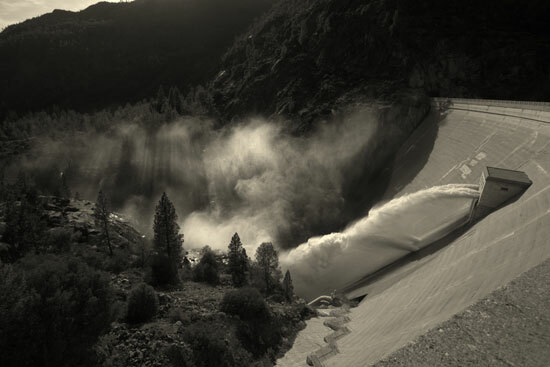 To this end, the WSIP includes the construction—now completed—of a connection between the Hetch Hetchy system and the East Bay Municipal Utility District, bringing flexibility for both sides of the Bay in the event of an emergency. 1 The WSIP's $4.6 billion revenue bonds will be repaid by all SFPUC customers proportionate to their water use. This includes retail customers—residents and businesses in San Francisco—and the SFPUC's wholesale customers: 27 water agencies that serve the Peninsula and parts of the South Bay and East Bay. In 2002, San Francisco voters' approval of Propositions A and E authorized the financing for the 40 WSIP projects to be constructed within the city. Originally, the WSIP was to include both capital projects and water supply delivery guarantees through 2030. 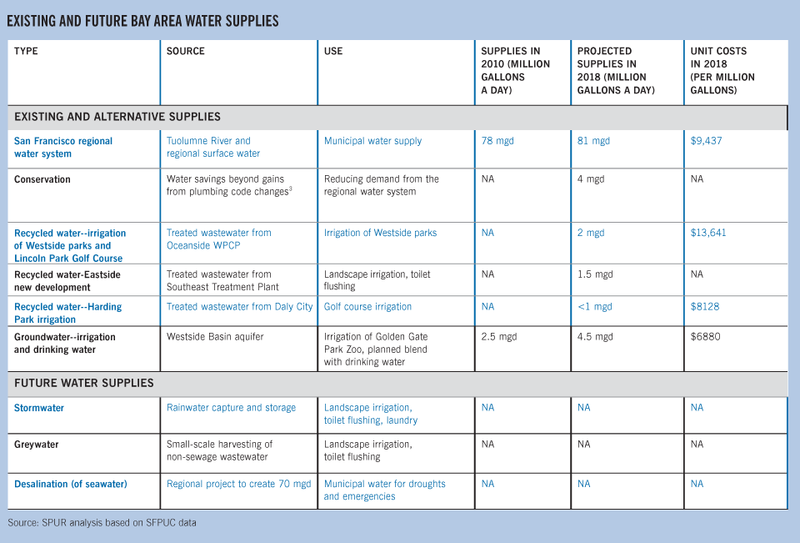 In preparation for the WSIP's environmental review in 2007, both the SFPUC and its wholesale customers, who use about two-thirds of the water, calculated their respective water needs in 2030. The projected overall increase in demand from expected economic and population growth was 14 percent greater than existing deliveries. The SFPUC proposed, through the WSIP, to deliver an additional 25 million gallons a day from the Tuolumne River. Not only would this new diversion potentially threaten the health of the river downstream from Hetch Hetchy, but that much water also might not even exist in years of severe drought. Some advocates, including SPUR, urged the SFPUC to move forward with the capital program and work separately on the supply assurance matter, pending additional analysis such as an ecological assessment of the upper Tuolumne to determine what flows are necessary to maintain its unique ecosystems and a more robust evaluation of potential impacts of climate change on water supply. The WSIP alternative adopted by the SFPUC in October 2008 capped water sales at existing levels of 265 million gallons a day through 2018. As a result, the SFPUC and its wholesale customers must meet their supply needs through 2018—and possibly beyond—through alternative water supplies and conservation. Each must find 10 million gallons a day from local sources, including more efficient use of existing supplies. The SFPUC is planning to meet this 2018 challenge by boosting conservation and developing two new alternative water supplies to make up the required 10 million gallons per day: up to 4 mgd from recycled water, 2 mgd from groundwater, and 4 mgd of demand reduction from conservation. The City does not actually expect retail demand for water to increase by 10 mgd in 2020 or 2030. In fact, residential consumption is expected to be relatively flat, even accounting for new development—adding people and jobs. This savings in spite of growth can be attributed to state plumbing code changes, which are slowly improving water efficiency across California, and to recent local ordinances that have accelerated these plumbing code savings in San Francisco. Between the City's Green Building Ordinance, which requires all new development to be highly water efficient, and recent "retrofit-on-resale" legislation covering existing development (discussed below), our relatively flat demand projections for 2018 already include a "plumbing code" water savings of 10 mgd. Commercial and industrial demands are expected to increase slightly, so the projected net increase in local water demand is slightly less than 2 mgd. Why develop 10 mgd when we think we'll need less? Even if demand doesn't rise, it's still important to prepare for a multi-year drought or a major earthquake, to reduce pressure on the Tuolumne River and to more efficiently pair water sources with uses. The alternative water supplies are reliable regardless of changes in the hydrologic cycle, or the snowpack in Yosemite. Drought resilience translates to climate resilience. The environmental impact report for the WSIP examines the potential impacts of climate change on the regional water system, and the SFPUC has since studied climate impacts in even greater depth. The agency predicts that the overall quantity of precipitation falling in the Hetch Hetchy basin would not radically change by 2030, but more of it is likely to fall as rain than as snow. This change can be handled operationally within the system's existing confines. But the prediction is a short-term estimate, and models are only tools to help us make predictions in the face of uncertainty. In the event of a multi-year drought, the SFPUC might not even be able to meet its retail customers' demand in 2030 without alternative supplies. The alternative water supplies are local, giving us more options in the event that a major earthquake disrupts the regional delivery system. They also are efficient, saving the best water for the highest uses, especially during a drought. For example, conservation practices and technologies allow less water to meet the same end uses, and save customers money. Using recycled water to irrigate golf courses and parks saves the more pristine Tuolumne flow for drinking and bathing. A better use of Hetch Hetchy system water not needed in San Francisco may be to let it flow in its natural course down the Tuolumne River, or to augment supplies of the SFPUC's wholesale customers who are projecting much greater demand in 2030. Recycled water is highly treated wastewater. Its use is regulated and monitored daily, and it is required to meet strict health protection standards. San Francisco has been slower than most cities and towns in the state to develop recycled water supplies for its approved uses of landscape irrigation, street sweeping, industrial uses, wetland restoration and commercial laundries. Although we have not developed any recycled water facilities yet,2 the Bay Area communities of Daly City, Oakland, Alameda, Palo Alto, Redwood City, Santa Clara and San Jose all use recycled water. Some of these cities have been using recycled water for more than 20 years. 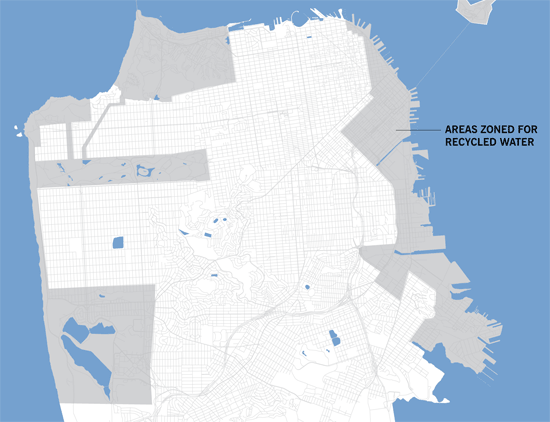 San Francisco's work to develop recycled water is occurring on two geographic fronts. The most developed plans are in the City's western neighborhoods: the Westside Recycled Water Project and the Harding Park Recycled Water Project. The Westside project would build a recycled water treatment plant for membrane filtration, reverse osmosis and ultraviolet disinfection in the southwest corner of Golden Gate Park. A new pipeline under the Great Highway would supply the facility with secondary-treated effluent from the Oceanside wastewater treatment plant south of the San Francisco Zoo. The project also includes building new storage facilities and pipelines to deliver recycled water throughout Golden Gate Park and to the California Academy of Sciences, and to Lincoln Park Golf Course near Land's End. This project will deliver approximately 2 mgd consistently, and as much as 4.5 mgd during peak summer demand. The Harding Park golf course project involves building a pipeline to the course from a recycled water treatment facility in Daly City, just south of Lake Merced. The plant's owner, the North San Mateo County Sanitation District, produces more recycled water than its existing customers—largely the other golf courses in the lake's vicinity—demand. In 2003, the SFPUC, Daly City, Friends of Lake Merced, three private golf clubs and the CalTrout sportfishing and habitat advocacy group developed a landmark agreement to restore alarmingly low water levels in Lake Merced by switching to recycled water instead of drawing groundwater from the shallow aquifer that feeds the lake. By switching to recycled water at the City-owned Harding, the lake's health stands to further benefit, and more of the highest quality water from the Hetch Hetchy system can be put to more appropriate uses. While the construction of the Westside project is likely to commence in 2011, the east side of the city is also a good place to develop recycled water. This is because many buildings in downtown and Mission Bay are already plumbed for it through "purple piping"—pipes colored specifically to indicate they convey only recycled water and to prevent cross-contamination—and because we expect much of San Francisco's population and economic growth to occur there. The SFPUC recently has completed a study of the market demand for recycled water on the east side. The study evaluated the recycled water demand of redevelopment areas including the neighborhood around the Transbay Transit Center, Mission Bay, Hunters Point, Pier 70, the backlands at Pier 90-94 and more. These areas and developments are required to use recycled water for appropriate applications if the SFPUC can make it available. The potential demand of these areas was estimated to be approximately 2 mgd. The SFPUC is still evaluating how to cost-effectively site recycled water facilities and supply these customers on the east side. The main drawback of recycled water is that it is expensive to build the necessary infrastructure, including transmission, and is energy-intensive to produce. While the SFPUC estimates the cost of delivering Hetch Hetchy water to the city's taps at $9,437 per million gallons, in 2018 recycled water costs for the Westside are projected to be $13,641 per million gallons. The Harding Park project is less costly even than retail delivery at $8,128 per million gallons, but it is a much smaller project drawing from an existing facility. The cost of developing this source, however, must not only be thought of in terms of its hard costs, but in terms of the opportunity costs of finding some other source of reliable water for the low marginal-value uses it serves. We might also consider its marginal costs over what we already pay for secondary wastewater treatment. Just adding tertiary treatment to make this recycled water a usable resource is a relatively small investment compared to the embedded costs of originally delivering the water through the Hetch Hetchy system, disinfecting it, conveying it to millions of faucets, and pumping and intensively treating it at wastewater facilities. Recycling water ultimately makes good on these other investments by giving us more bang for the buck, extending the value of a resource that otherwise would be sent out to sea. Groundwater is a major source of drinking water around the world. Groundwater supplies about 25 percent of the United States' daily water use—most of it through private wells—and 40 percent of California's water. Groundwater is also the major source of many surface water features, especially lakes and wetlands. Seven different groundwater aquifers underlie San Francisco, but only one is significant enough to supply municipal drinking water. Under the west side of San Francisco lies a very deep and extensive aquifer 350 to 450 feet below the ground surface. This aquifer extends as far south as Burlingame and provides nearly half of the drinking water used in Daly City, South San Francisco and San Bruno. Tapping the north Westside groundwater basin—the part beneath Golden Gate Park to Lake Merced—can sustainably augment San Francisco's drinking water by 4 million gallons daily. Beginning in the early 1900s, this aquifer periodically has supplied water to the City for farming and drinking. But wells tapped in the early 1930s for emergency water supply were discontinued when Hetch Hetchy water became available only a few years later. The SFPUC plans to tap this aquifer again, to blend groundwater with imported water in the City's water supply system. The mix would contain approximately 10 percent groundwater and be distributed to about half the geographical area of San Francisco. 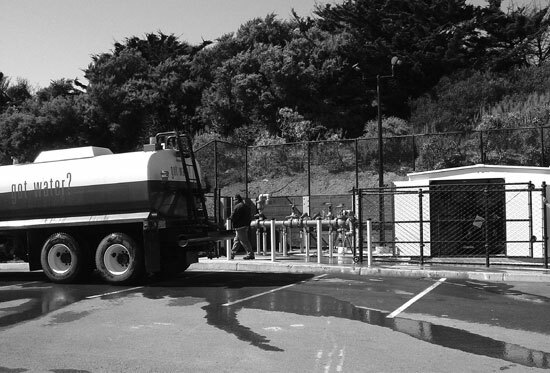 The process involves building four new wells—at Lake Merced, the west Sunset and south Sunset playgrounds, and Golden Gate Park—and replacing two existing wells in the park that are used for irrigating the park and not for drinking water. The SFPUC has carefully monitored the quality of the Westside groundwater basin for many years, and the water needs only to be disinfected (due to regulations) before being blended with the regional imported water. Two of the sites that will host new groundwater wells will be equipped as emergency water supply stations. They will have onsite disinfection, and the ability to hook up to tanker trucks that could distribute water around the city in the event of an earthquake or other emergency. Groundwater is inexpensive to produce—even less expensive than the wholesale cost of delivering regional water. However, it does require some energy for pumping, and carries construction costs to lay pipes to deliver newly tapped groundwater to the Sunset and Sutro reservoirs. Groundwater mining becomes unsustainable if pumping rates exceed replenishment from percolating rainwater or other sources. Such an imbalance can cause ecological damage if it lowers water levels in the surface features it feeds—a problem that recently has been rectified at Lake Merced. To this end, the SFPUC is working on an agreement with water agencies on the Peninsula, who use much more groundwater from this same aquifer than the City will, to provide extra imported water from Hetch Hetchy in wet years in exchange for not pumping an equivalent amount of groundwater from the Westside groundwater basin. This lets the aquifer recharge while serving as a storage reservoir that can withstand higher pumping rates in dry years. This type of arrangement, called conjunctive use, is a strategy that plans for the management of surface water and groundwater together, to increase the efficiency and reliability of water use. Part of the plan for withdrawing groundwater also includes monitoring aquifer levels to ensure against saltwater intrusion, land subsidence and declines in lake levels. Groundwater on the east side of the city erratically presents itself through natural springs that bubble up in such places as Twin Peaks, the Mission District, Hunters Point and the Civic Center. Many buildings —and even BART—pump groundwater out of subterranean areas to keep them dry, sending the water into the wastewater system. Although such water potentially could be reused beneficially, it has not been extensively tested for potable uses. The SFPUC is planning to evaluate the potential, including the quality and cost-effectiveness, of capturing this water for irrigation, street sweeping or other industrial uses on the east side. One idea is to capture groundwater and store it in a cistern at the Powell Street BART station. Water conservation—reducing our demand for water—is the cheapest, most timely and most efficient way to prevent waste and augment our water supplies. But it is also the trickiest and most incremental of all new sources that the SFPUC is counting on to meet the 2018 goal of boosting the city's water supply by 10 million gallons a day. One challenge is that conservation is much messier to implement than other ways of making water supply and demand match up: it can be detected only through reduced water sales, the consistency of those reduced sales and through savings estimates from participation in programs such as rebates for water-efficient appliances and water audits. Another difficulty with conservation is that San Francisco already is very efficient in its water use, having reduced total consumption of water more than 20 percent, and per capita water use by nearly a third, over the past 30 years. Today, residential per capita water use is lower than in any other urban area in California, and about one third of the state average. Largely, this achievement is due to our geography and urban form; we generally use less water than other California cities for landscape irrigation because of our dense, compact housing and mild climate. We have very little outdoor water use from which major conservation gains can be made. The nature of San Francisco's water use means that marginal reductions through conservation and efficiency measures will be ever harder to obtain. But SFPUC research shows there still are opportunities for savings through the broader adoption of water-efficient plumbing fixtures and through reductions among large municipal and commercial customers, especially in landscape irrigation. In the future, San Francisco will augment these conservation gains in new buildings covered by the City's 2008 Green Building Ordinance, which requires large and mid-size commercial buildings, along with high-rise residential buildings, to meet criteria established by the U.S. Green Building Council for reducing potable water use. For older buildings, the City passed legislation in 2009 updating 1991 housing and building code guidelines for retrofitting properties with water-efficient plumbing fixtures. The new legislation requires that all residential properties be outfitted with high-efficiency plumbing devices, such as low flow faucets, showerheads and toilets upon their sale—a practice known as "retrofit on resale." The 2009 law also requires the owners of commercial properties to do the same when they undergo major tenant improvements, and requires all commercial properties to retrofit by 2017. To help people comply, the SFPUC supplies free smaller plumbing devices, and provides rebates for larger, water-using appliances such as clothes washers and toilets. The retrofit-on-resale legislation is expected to reduce water use by 4 mgd by 2017—accelerating plumbing code savings that otherwise would not have been achieved until 2030.4 A new loan program, "Green Finance SF," is set to launch in 2010 and will provide another way to help property owners finance major improvements to energy and water efficiency. Green Finance SF will allow building owners to pay upfront costs over a long term, and then attach the repayment to the owners' property taxes. New programs to be rolled out in the next few years include direct installation of high-efficiency toilets for low-income customers, water efficient irrigation systems in municipal parks and conservation programs for larger landscaped areas greater than 2.5 acres. These conservation measures are expected to reduce water consumption and assist with meeting the goal of an additional 4 mgd of water savings by 2018. Only recycled water, groundwater and conservation are being formally planned to offset San Francisco's use of imported water over the next few years. But other sources, including stormwater, graywater and desalinated water, are being considered for future supplies. Stormwater can be useful in two ways. Directed to swales and rain gardens, it can recharge groundwater (or surface supplies, such as the dwindling Lake Merced). Captured in cisterns or rain barrels, it later can be reused for onsite landscape watering, toilet flushing or other uses similar to those of the more centrally distributed recycled water. Capturing stormwater to offset potable uses produces a double benefit by reducing peak storm flows to wastewater treatment plants, diminishing the likelihood of overflows of San Francisco's sewer system, which gathers both wastewater and stormwater. The SFPUC's stormwater design guidelines,5 which the Green Building Ordinance refers to and which await adoption by the Board of Supervisors, would require any new development larger than 5,000 square feet to file a stormwater control plan. The plan must meet certain water quality controls in the City's separate sewer areas—mostly around its fringe—and quantity controls in the combined sewer area. As part of its work on the Sewer System Improvement Program and Wastewater Master Plan—both in development—the SFPUC will conduct extensive modeling to determine how much potable water could be saved by capturing and reusing more stormwater in the future. The SSIP is likely to contain funding and programs to develop this resource. Graywater is wastewater captured directly from washing machines, showers and sinks. It may contain diluted soap and food particles but does not include water that has ever come in contact with sewage (which is sometimes referred to as "blackwater"). Graywater is a poor candidate for centralized collection, treatment, and redistribution. But as of late 2009, it is legal in California to build a simple, noncommercial graywater system, such as one that uses laundry water for landscape irrigation. The changing political landscape surrounding graywater is based largely on misperceptions about its safety for public health. If used and produced correctly, with low-salt soaps and detergents, low-cost graywater systems can save people money and beneficially reuse the water delivered by regional water supplies. Later this year, the SFPUC will launch a pilot graywater rebate program for simple graywater systems to allow the reuse of washing machine water for irrigation. Desalination distills clean drinking water from the ocean or brackish sources. Desalination uses a lot of energy and produces leftover brine. Desalination is most popular in arid regions with abundant energy and no other water options, such as the Middle East and North Africa. In California, the first desalination plant was approved in 2009 for a Carlsbad facility supplying the San Diego region with 50 mgd. While desalination is climate-proof and has an unlimited source of supply, it should be a measure of last resort in any water agency's portfolio because every other option—conservation, efficiency, recycled water, and so on—is more cost-effective and environmentally sound. The SFPUC has entered a partnership with other regional water agencies including the Contra Costa Water District, the East Bay Municipal Utility District and the Santa Clara Valley Water District to assess the feasibility of a regional desalination plant that could provide critical backup during droughts or emergencies. Results will be available in 2010 for an SFPUC-sponsored pilot project in Contra Costa County to evaluate different treatment technologies and environmental impacts of desalination. How are the 27 water agency customers of the SFPUC doing at developing their own 10 mgd of alternative supplies? For years, wholesale customers have been more aggressive at developing alternative sources such as recycled water and groundwater than San Francisco has—because they've had to be. Growth in demand among customers on the Peninsula has required water agencies there to better match water resource types with needs. Contractual limits on water from San Francisco and regulatory constraints on wastewater effluent have essentially forced a few of these utilities to develop recycled water to reduce sewer overflows and prevent further deterioration of water quality in San Francisco Bay. The 27 water agencies today make up the difference between the 184 mgd they are guaranteed by the SFPUC and the 292 mgd they actually use by drawing on alternative surface and groundwater supplies, the State Water Project, recycled water and conservation. In the purchase request considered in the original process of the Water System Improvement Program, wholesale customers sought an additional 25 mgd of Hetch Hetchy regional water supplies to support demand in 2030. Wholesale customers already recycle more than 15 mgd, and are committed to 38 mgd of conservation through programs and plumbing code savings by 2030. The additional 10 mgd they must make up on top of these plans will come from even more aggressive implementation of water conservation and efficiency, and expanding production of existing water recycling plants. Many cities on the Peninsula and in the South Bay have requirements for plumbing retrofits upon the sale of a property, like the SFPUC's "retrofit-on-resale" legislation. The Bay Area Water Supply and Conservation Agency, which represents 26 of the 27 wholesale customers in negotiation with the SFPUC and has state authority to plan and implement water conservation and water supply programs, holds low-water landscaping classes throughout the region. It also has developed model ordinances for cities to adopt water-saving requirements for indoor and outdoor water use, and require disclosure of a property's water use upon its resale. Water utilities today face more pressure and more opportunities than ever. While San Francisco and its wholesale customer agencies enjoy the benefits of water rights on the Tuolumne River, our region is growing and so is our long-term need for water. We don't know how much the snowmelt or rainfall in the Hetch Hetchy basin will change as the climate does, but we know that the far-reaching impacts of drought beyond 2030 may be more severe than the mild changes predicted to come before that time. We know from ecological studies that reducing instream flows can be devastating to a river's health, and we also know that the Bay Area has achieved a broad consensus about maintaining a viable, healthy Tuolumne River. In addition, we now have the ability and technologies to make better use of the water we dam and divert, to get more from less, and to transform previously undrinkable water for our use. We know the value of having diverse, locally obtainable water supplies that are drought-proof and climate-proof, and provide resilience in an emergency. Our ability to bring them to the tap, though, depends on public support. Fortunately, there is a process for this. Each type of water that the SFPUC plans to bring online by 2018 will undergo public scrutiny and environmental review. And even today, water users can inexpensively install low-flow devices, audit their home or business for leaks, harvest and reuse rainwater and graywater—and simply use less water each day. Everyone can participate in the process of a sustainable water future, and the clock is ticking. Laura Tam is SPUR's sustainable development policy director.